Reference number for this case: 15-oct-54-Londinière. Thank you for including this reference number in any correspondence with me regarding this case. The news is a consumer of saucers and other flying machines, and there are few areas that have not yet been found in these apparitions a topic for dissertation. However let's confess that Normandy was not, until now, really hit, and it is reasonable to ask whether the wisdom of the Normands; who are not easily led and taken by the "one said," does not play a major role here. But just now information comes from Londinières that can help our province (which would thus show its desire of not being unfashionable) to rise to the level of other regions who "saw it". And all of a sudden, we get four saucers, a cigar and a strange being (1 m. 20, as it should be, not to break the charm) with other features that have nothing so unique either. Robert Henri was traveling by car on National Road 214, at dusk, between Mesnières and Londinières - where he lives - when, in Bagnolet, he saw four craft one above the other, of orange color, "appearing to be flying saucers"; which evolved 300 meters high. One of them broke away, came down and came to swerve his car before disappearing. At the same time, Mr. Robert had felt like a strong electric shock and controls of his vehicle had been temporarily annihilated. No sooner had he recovered from his surprise, just 3 kms away, Mr. Robert saw in his headlights in the middle of the road, a strange being about 1 m. 20 tall. This time it was his headlights that went out and immediately went on again. The motorist then noticed on the edge of the slope, a three-meter long craft, pointed at both ends and cylindrical. The famous cigar, in every sense of the term, which took "one second" to disappear, lights off, in the direction of the North. It was at one o'clock on Saturday that Mr. Robert came to the gendarmerie of Londinières to tell the story of what he saw and felt. But his statements were incoherent, his words made no sense. Effect of concussion which he said he was the victim of a few hours earlier, or reaction caused by a pile of saucers of another kind, a more usual sort on some tables. This did not prevent Mr. Robert to confirm his story at 9:00 a.m..
Failed attack against a fake "Martian"
LILLE. Oct. 16 (A.F.P.). -- Mr. Maurice Ruant, farmer in Sinceny (the Aisne), was busy repairing his car in a field, when two gunshots were fired at him. The shots crashed into the car's body, near his head. The investigation allowed to quickly find the author of two gunshots, a neighbor, Mr. Faisan. I thought, he said, seeing a figure moving in the light of two headlights, I was in the presence of a Martian repairing his flying saucer. I went to get my rifle and I shot. No, the Dieppe area is not disinherited! And each day brings new appearances in the sky of France and elsewhere. Our area had not hitherto been favored by these machines which one currently makes a large consumption of and on which one debates endlessly. Products of vivid imaginations, hallucinations, phenomenon of condensation? One is at lost and it does not seem that we are near an explanation which could confirm the statements of those who "saw" or catch the others "who believed to have seen" or started "hoaxes". Our area, we just said, was not particularly visited by these mysterious machines, had not been haunted by beings which are no less mysterious. But today it is not the same any more and this thanks (!) to the story that, in the night of Friday to Saturday, to the gendarmerie of Londinières, Mr. Henri Robert, who lives the latter city, made. To him alone, and in a very short lapse of time, he states to have seen four saucers, a cigar, and a strange being. Very beautiful spoils, isn't it? But let us come to the conditions under which all this armada from another world came to ravel under the eyes of Mr. Robert. The latter, by car, droved Friday at nightfall, on the Road RN 414 between Mesnière-en-Bray and Londinières, when in Baillolet his attention was caught by the presence, above him, of a group of "four superimposed machines, of orange color, seeming to be flying saucers, which moved a few three hundred meters high." Suddenly, he saw one of the craft part from the other and come zigzaging ahead of his car, whose controls were temporarily disabled. At the same time, he felt like a strong electric shock, while the "saucer" disappeared. After he recovered, Mr. Robert resumed his travel. But, three kilometers after the first appearance, the motorist saw in the gleam of his headlights a strange being, approximately 1.20 meters tall, who crossed the roadway. "At this time, my headlights died out suddenly, then re-ignited", Mr. Robert stated, and then he added to have observed at the edge of the slope a three meters long machine, of cylindrical form and pointed at its two ends. After the saucers and the strange being, the cigar, which "took only one second to disappear all fires extinguished in the direction of the North." This, we mentioned earlier, happened at nightfall, but it is only at one o'clock in the morning, Saturday, that the witness of these successive appearances presented himself to the gendarmerie of Londinières. One cannot say that at this time the report he made was very clear. Effect of the strong commotion which he said he felt? Anyway, in spite of the absence of traces left at the edge of the road by the "interplanetary" machine and although no other person of the area came to reveal the same facts, Mr. Henri Robert confirmed his account Saturday morning. At nightfall, while traveling by car, in the commune of Baillolet (Seine-Inférieure) on R.N. 314, Mr. Henri Robert, a veterinary doctor in Londinières, saw four craft maneuvering one above the other, about 300 meters above sea level. The two employees at Orly airport are MM. Raymond Castelle and Charles Birest who affirmed to their chiefs to have seen on Sunday evening a flying saucer crossing the sky of Orly "from East to West" at the speed of a jet plane, reaching the town of Paray-Vieille-Poste, that is to say, on the west-east runway, the mysterious craft, which, according to the witnesses, was moving at he altitude of 300 meters, stopped for about ten seconds while turning on itself and emitting rays that reflected intensely on the ground. As for the three firefighters, Captain Doussineau and Warrant Officer Serreau, they were driving on a road near Chatellerault (the Haute-Vienne) when they saw rise in the sky towards the castle of Targe, a large luminous disc. They stopped and observed the phenomenon at length. "The disc," they said, "passed above us at a few meters barely while emitting an high pitched whistling sound." Jimmy Guieu indicates that on October 16, 1954 close to Dieppe at nightfall on national road 314 in the commune of Baillollet, Doctor Henri R., veterinary surgeon, saw four machines which moved the ones above the others at approximately 300 meters of altitude. One of these apparatuses was detached from the flotilla, dove towards the ground, zigzaged in front of the witness' car, and he then felt an electric shock and the car's engine stopped. He then saw on the road a weird being approximately 1.20 meters tall, and at once, the car's headlights died out. When they were re-ignited by themselves without intervention of the witness, the small being had disappeared but a cylindrical craft of approximately three meters in length took off from the slope bordering the road, and took the direction of North. The statements of the witness were recorded by the gendarmerie of Londinières. Aimé Michel indicates that on October 16, 1954, at the fall of the night, veterinary doctor Henri Robert of Londinières in Normandy was driving on National Road RN 314 at the south-east of Dieppe. Whereas he was going through the village of Baillolet, he noticed four circular machines which were one above the other and evolved at a moderate speed in the sky, at a height he estimated to be of 300 meters, and in the prolongation of the road in front of him. As soon as he had seen them, one of the four machines left the formation and descended towards the ground while zigzagging, ending on the road in front of him, with his car and this object now being on a collision course. Whereas his car and the machine were not more distant than a hundred meters, Doctor Robert felt like an electric shock, and at the same time, the engine of his car stopped and its headlights died out. The car stopped rolling at the time when the object landed on the road. Doctor Robert found himself unable to move, and saw a small being of approximately 1 m 20 of height in the gleam released by the object on the road. Then all lights died out and he could not see anything anymore. The darkness lasted a few minutes, then his car's headlights functioned suddenly again, and doctor Robert could see in their beam that the machine which had been posed on the road was now moving away to the north at a level close to the ground on the cropped-mound along the slope which bordered the road, this road being oriented North-South in this place. Doctor Robert returned to Londinières and wrote a report which he submitted to the gendarmerie. Author Michel Carrouges indicates that on October 16, 1954, in the Seine Maritime, Mr. Robert, in a car, saw the landing of a luminous flying saucer within 100 meters, with appearance of small pilots. The witness felt an electric shock, the engine stalled, the headlights died out. Carrouges notes this case in his listing of cases with physical effects, and indicates Aimé Michel as source. Seine-Inferieure France. October 1954 'Electric shock', car engine & headlamps went out same time. 300 feet. The authors write that the rather indistinct figure of a human-shaped entity was observed by Dr. Henri Robert on October 16, 1954, in the village of Baillolet in France. Robert saw four objects flying at about a thousand feet altitude, one above the other. Suddenly one of the craft dropped to the ground much like a dead leaf floating to earth, about 350 feet In front of Robert's car. Then Robert felt a kind of "electric shock," his engine stalled, and the headlights went out. The car stopped just as the object touched the ground. The doctor, incapable of movement as though paralyzed, watched a figure which appeared to be about four feet tall moving in the light of the object, then everything went dark. Some time later the lights of the car went back on and the witness saw the object taking off toward the north, above the road. The doctor called the authorities when he arrived in Londinieres, and reported the incident. The authors comment that the "dead leaf" movement of a landing or slow-moving disc has been described in many reliable and well-documented UFO reports, throughout the world, and was first noted as one of the outstanding characteristics of saucer-shaped craft over the United States in the early years of the mystery. October 16, 1954, southeast of Dieppe, France. Dr. Henri Robert was driving when he spied four discs flying in formation in the sky. One of them "peeled off" and came swooping low over his car. Dr. Robert says he felt a kind of "electric shock," and at the same time his engine died and his headlights went out. Dr. Robert then became paralyzed and could not move as the UFO landed on the road and a little creature 3 feet tall shone a light at him. When the tiny man and the UFO left moments later, Dr. Robert was able to move and start his car. Oct. 16, 1954, nightfall. Baillolet (France). Dr. Robert, while driving through this village, saw four objects, at about 300 m altitude, flying slowly in echelon formation. Suddenly one of them dropped to the ground with a dead-leaf motion, 100 m away. The witness felt an electric shock as engine and headlights died, and the car stopped when the object touched the ground. Incapable of moving, Dr. Robert saw a figure about 1.2 m tall moving in the light of the object, then all went dark. Some time later the headlights resumed operation by themselves, and Dr. Robert saw the craft take off toward the north. (Paris-Presse, 19 oct 1954) (71; M 185). The author indicates that at nightfallon October 16, 1954, the veterinary doctor Henri Robert was driving the Main Road 314 in the area of Dieppe and was not far from Baillolet when four brilliant circular craft appeared in the sky, evolving one above the other at 300 meters of altitude right in the center line of the highway opposite the car. As soon as the witness saw them, one of the apparatuses descended while zigzaging to ground-level and continued to advance straight ahead while the witness did the same way, so that his car and the craft approached quickly. 50 meters before the collision, the car stopped, with the engine stalled, and the headlights went off. The doctor was paralysed at his steering wheel by an electric shock, and managed to see, in the light emitted by the stopped UFO, a small being which seemed busy around the apparatus. Then the light weakened and went off, and silence and the night reigned a few minutes. After that the headlights turned on again and the doctor saw, in their beam, that the UFO was moving away along the slope while gaining altitude. The two ufologists and authors report that on October 15, 1954 at abour 07:45 P.M., the veterinary surgeon Henri Robert was driving in his car between the villages of Fresnoy-en-Val and Chais, coming from Neuchâtel-en-Bray. Having just crossed the wood of Hillet, he saw on his right a distance which he evaluated as 300 meters, four circles of orange color superimposed and more luminous for those at the top than those at the bottom. "Suddenly, as if I just have been spotted, the smallest circle, the one at the top, detached from the group at a vertiginous speed and darted in my direction. Two seconds hardly, and it was on me. It came at a few meters in front of my vehicle, while zigzagging just above the level of the ground. I feel at the same time an electric shock. My car does not "obey" me anymore. The car is like insane! It lasted about fifteen seconds. Then, the machine sets out again towards the group, which disappears at once." "While arriving at Bailleul-Neville, at the crossroads of La Motte, 3.500 km from the first appearance, and within 150 meters in front of me, I see in my headlights a being of approximately 1,20 m in height, rather fat, arms and legs spread. I have hardly time to note that its clothing is of gray-bluish color. My headlights die out. They are re-ignited 2 or 3 seconds later: the small being had disappeared. Instinctively, I accelerate. But I have the time to see, on the edge of the slope, between a pylon and a transformer, a cylindrical craft, frayed at the two ends, long of 3 to 4 meters, all fires extinct. At this very moment, the craft takes off vertically, rises quickly, and disappears in the direction of the North." The American ufologist indicates that on October 16, 1954, in France, in Baillolet, Dr. Robert, in his car, saw four low and slow flying objects, in spread out formation. Suddenly, one of them dropped at the ground like a falling leave, at a hundred meters from there, the doctor felt an electric shock, his engine stopped, his headlights died out. He was unable to move and saw a silhouette of approximately 1.20 meters moving in the light of the object. Then, everything died out, his headlights turned on again by themselves as soon as the machine had left the place. The author indicates that this example of case of a close encounter of the third kind comes from the catalogue by Jacques Vallée who extracted it from the Aime Michel's book. In his chapter on the cases of paralysis or drowsiness of UFO witnesses during their experience, Pierre Delval indicates 12 cases from the French flap of 1954, among those, that in Baillolet in the department of the Seine-Maritime on October 16, 1954. Doctor Robert, MD, observed a formation of "flying saucers" in the sky. One of them landed while zigzagging on the road within 100 meters of its car. The doctor felt a sort of electric shock while his headlights died out and the engine of his car stalled and immobilized. Unable to move, the doctor saw a small being busy close to the craft which took off soon, and all was normal again. Elsewhere in his book, he indicates that on October 16, 1954, a nightfall Henri Robert, veterinary surgeon, drives on National road 314 and arrives close to Baillolet when suddenly, in the sky, four brilliant circular machines, hovering one above the other at 300 m of altitude, appear, right in the center line of the highway opposite the car. He had hardly noticed this, that one of them goes down while zigzaging to ground-level and continuous to advance straight, while Mr. Robert does the same, so that the two vehicles quickly approach one another. 50 meters before their probable collision, the car stops short, motor stalled, headlights extinct. All the electric circuit of the car is blocked and does not function anymore. Paralysed at his wheel. Mr. Robert sees, in the light released by the stopped U.F.O., a small being which seems busy around the machine. Then the light of the machine weakens and ends up dying out. Then, the headlights of the car are re-ignited for the switch remained on, and, in their beam, Mr. Robert sees the U.F.O. moving away along the road slope while taking altitude. "R. H. (45 years old), veterinary surgeon (of Londinières? ), returned from Neufchâtel en Bray with his car and had crossed the wood of Hellet. He sees on his right between the hamlet of Fresnoy-en-Vallée and the Mount de Clais, at 2,5 km of him and 300 meters of altitude, 4 circles of orange color superimposed and being degrading without noise. Duration: 30 seconds." "At one moment, the last (that on the top), the smallest, is detached from the lot and, at a vertiginous speed, rushes in direction of the witness. In two seconds it is on him and zigzags in front of the vehicle at nearly the level of the road - Strong electric shock; the vehicle does not obey any more. This lasts 20 seconds. The phenomenon disappears without noise. The machines accompanying the saucer which operated disappeared at the very start of the maneuver." "While arriving at Bailleul-Neuville, at the crossroads of la Motte, 3,500 km of the first appearance, 150 m approximately, in the headlights, the witness sees a being, 1,20 m to 1,30 m tall, rather broad, arm and legs spread, looking in front of him - color bluish gray. The headlights of the car died out, then relit; the being disappeared. Increasing pace, the witness has the time to see, on the edge of the grassy slope bordering the road, in direction of the hamlet on Neuville, on the left side, between a pylon and the power transformer, a machine of cylindrical form, frayed at the two ends, 3 m long, all lights off. In the headlights, he saw the machine rising vertically and, at fast pace, taking the direction of the North." They indicate that this is in substance the nature of the statements made by the Norman veterinary surgeon to the gendarmerie, and that the observation "appears of course in many books where it is located in different localities: in Fresnoy-en-Vallée, Baillolet amongst others." They thus state that some ufologists have no rigour in their work, and that, more serious still, the facts "are explained with much with difficulty". They indicate that the book "Face aux Extraterrestes" by Garreau and Lavier gives this case, that they reproduced word for word above. They add: "We think, that being given its origin, it constitutes the gist of a testimony", but that in his catalogue, Jacques Vallée also takes the case in consideration, but by mistake or willingly, he seems to closely bind the two phases of observations, that the distance of 3.500 km crossed by the veterinary surgeon between the two scenes which he observed is thus missing. They wonder whether it is an omission, or "a facility of demonstration", and let the reader judge that. They then explain that they "regarded this case as having serious criteria of credibility": a "veterinary Doctor in a small village, a report to the gendarmerie, details in the description of the observation, all was there to make this story a solid object of study." They thus tried to find the witness, but he was not subscribed any more to the telephone service. His successor should tell them if he can still contact him, but the witness died two years after these events. Hearing their disappointment, their correspondentasked about their interest, they explained the exact nature of their research. The authors indicate that consequently, the "holy credibility" had its virtue seriously compromised, for they learned that the witness, in spite of his job, had annoying habits, "he often drank! [alcohol]"
They then continued the investigation with the mayor of the city who said: "he was quite a nice chap but always between two glasses", and his doctor added that he had succumbed to a cirrhosis of the liver two years after the observation. "Suddenly, as if I had been located, the smallest circle, the one at the top, dived towards me; hardly two seconds and it is on me. It comes at a few meters in front of my vehicle, while zigzagging at near-ground level. At the same time, I feel a very strong electric shock. My car does not obey me any more. It is quite mad! This lasted about fifteen seconds, then the machine sets out again towards the group which disappears at once. While arriving at Bailleul-Neville, at the crossroads of the La Motte, at 3 km 500 of the first appearance, and within 150 meters in front of me, I see in my headlights a being, approximately 1 m 20 tall, rather heavy, arms and legs spread out. I hardly have the time to note that its clothing is of gray-bluish color: my headlights died out. They re-ignited 2 or 3 seconds later: the small being had disappeared. Instinctively I accelerate. But I had time to see on the edge of the slope, between a pole and a power transformer, an apparatus of cylindrical shaped, pointed at the two ends, a length from three to four meters, all fires extinct. At this precise time, the machine takes off with the vertical, rises quickly and disappears in the direction of the north." The alleged sighting was a drunkard's hallucination. The author indicates that on October 16, 1954, around 19 hours, the veterinary surgeon Henri Robert saw arriving in front of him at 300 meters of altitude four brilliant discs one above the other. One came down on the road within 50 meters and stopped him, motor stalled, headlights off. An humanoid came out and wass busy, the light weakened, the engine and the headlights were re-ignited, the craft flew over the slope and moved away. The source is noted "Pottier, 1974". The Australian ufologist indicates that on 16 October 1954 at night in Baillolet, France, Dr Henri Robert was driving at night saw four objects in the sky and one approached his car. When it was about 100m away, he felt an "electric shock.” The car engine died, headlights went out, and he was paralysed. A 1m tall creature was visible in light from the object. After several minutes the headlights came on and the paralysis ceased. The car could then be restarted. The source is noted "Michel A 1958 Flying Saucers and the Straight Line Mystery. New York Criterion Books.pp184-185." Dr Henri Robert, a veterinarian, was driving when he saw 4 discs in the sky, one of which descended with a "falling leaf" motion. When within 100 yards of it Dr Robert felt an electric shock and found himself paralyzed; his engine died and his headlights went out, as the object landed on the road. In the light of the luminous object, he could see a small figure slightly over 3 ft tall. After a period of darkness lasting several minutes, the headlights came on and the object was seen rapidly moving away. Dr. Robert watched 4 disc-shaped objects fly over his car. One dropped out of formation, Robert felt paralyzed. A small creature appeared & moved illuminated by the glow of the craft. 1954 – Dr. Robert, driving through Baillolet, France at nightfall, saw four objects flying slowly in echelon formation at about 300 meters altitude. One of UFOs dropped abruptly to the ground with a falling leaf motion, landing only 100 meters away. The witness felt an electric shock as the engine and headlights of his car died, and his car stopped the moment the object touched the ground. Incapable of moving, Dr. Robert watched as a figure about 1.2 meters (4 feet) tall moved around in the light of the object, then all went dark. Some time later the headlights came back on by themselves, and Dr. Robert saw the craft take off toward the north. (Sources: Aime Michel, Flying Saucers and the Straight Line Mystery, p. 185; Jacques Vallee, Passport to Magonia: A Century of Landings, pp. 231-232). One 3-ft tall being; one of four circular objects zigzagged down in front of car, witness felt shock, engine and lights failed; being visible in light from UFO. On October 16 in Baillolet, Dr. Robert, "while driving, saw four objects at low altitude flying slowly in echelon formation. Suddenly one dropped to the ground with a falling-leaf motion, one hundred meters away. The doctor felt an electric shock as his car's engine and headlights died. Incapable of moving, Dr. Robert saw a figure about .2 meters tall moving in the light of the object; then all went dark. Later, the headlights resumed operation by themselves, when the object left the area." Veterinary surgeon Dr Henri Robert was driving through this village on Route N-314 when he saw four objects at 300m altitude flying slowly in echelon formation. Suddenly one of them dropped to the ground in a dead leaf motion, 100m away. Robert felt an electric shock as his headlights and engine died, and the car stopped, when the object hit the ground. Incapable of moving, Robert saw a figure about 1.2m tall, moving in the light of the object, then all went dark. Sometime later his headlights resumed operating by themselves and Robert saw the craft skimming along the ground, taking off to the north. He was then able to move and restart his car. Vallee Case 274, citing Paris-Presse 19 October 1954. (140) Oct. 16, 1954 – Dr. Robert, driving through Baillolet, France at nightfall, saw four objects flying slowly in echelon formation at about 300 meters altitude. One of UFOs dropped abruptly to the ground with a falling leaf motion, landing only 100 meters away. The witness felt an electric shock as the engine and headlights of his car died, and his car stopped the moment the object touched the ground. Incapable of moving, Dr. Robert watched as a figure about 1.2 meters (4 feet) tall moved around in the light of the object, then all went dark. Some time later the headlights came back on by themselves, and Dr. Robert saw the craft take off toward the north. (Sources: Aime Michel, Flying Saucers and the Straight Line Mystery, p. 185; Jacques Vallee, Passport to Magonia: A Century of Landings, pp. 231-232). Dr. Henri Robert, a veterinarian, was driving when he saw 4 discs in the sky, one of which descended with a “falling leaf” motion. When within 100 yards of it Dr Robert felt an electric shock and found himself paralyzed; his engine died and his headlights went out, as the object landed on the road. In the light of the luminous object, he could see a small figure slightly over 3 ft tall. After a period of darkness lasting several minutes, the headlights came on and the object was seen rapidly moving away. This database recorded this same case 21 times instead of one! Not looked for yet. Probably caused by alcohol. Reports say it occurred at nightfall, no our being specified. Nightfall was between 7 and 7:30 p.m..
[li1] Article in the weekly regional newspaper Liberté Dimanche, Dieppes, France, October 17, 1954. 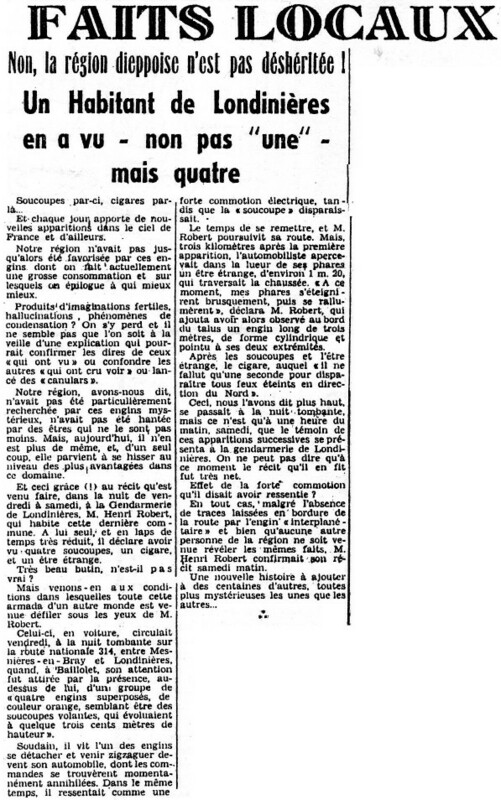 [---] Article in the national newspaper Paris-Presse, Paris, France, October 19, 1954. [jg1] "Flying Saucers Come from Another World", book by Jimmy Guieu, English version of "Black-out Sur Les Soucoupes Volantes", Citadel Press publishers, USA, page 185, 1956. [am1] "Flying Saucers and the Straight-Line Mystery", book by Aimé Michel, English version of "Mystérieux Objets Céleste", S.G. Phillips publisher, USA, 1958. [mc1] "Les Apparitions de Martiens", book by Michel Carrouges (aka Louis Couturier), Fayard publisher, France, pages 80,128, 1963. [lo1] "Flying Saucer Occupants", book by Coral and Jim Lorenzen, Signet Books publisher, USA, page 96, 1967. [jg1] "Black-Out Sur Les Soucoupes Volantes", book by Jimmy Guieu, Omnium Littéraire publisher, France, page 222, 1972. [jp1] "Les Soucoupes Volantes - La Guerre des Mondes Aura-t-Elle Lieu? ", book by Jacques Pottier, De Vecchi, France-Loisirs publisher, page 27, 1975. [gl1] "Face Aux Extra-Terrestres", book by Charles Garreau et Raymond Lavier, Delarge publisher, pp 138-139, 1975. [am1] "Mystérieux Objets Célestes", book by Aimé Michel, Seghers publisher, France, pp 246-247, 1977. [ls1] "Alerte Générale OVNI", book by Leonard Stringfield, French translation of "Situation Red: The UFO Siege! ", France Empire publisher, page 114, 1978. [pd1] "Le Grand Livre des Objets Volants Non-Identifiés", book by Pierre Delval with the Oranos Committee, De Vecchi publisher, pages 234-235,253, 1976. [bb1] "La Grande Peur Martienne", book by Gérard Barthel and Jacques Brucker, Les Nouvelles Editions Rationalistes publishers, France, pp 69-70, 1979. [---] "La Grande Peur Martienne", book by Gérard Barthel et Jacques Brucker, Nouvelles Editions Rationalistes publishers, France, page 99, 1979. [---] "Faces of the Visitors", book by Kevin Randle and Russ Estes, Fireside publishers, USA, page 269, 1997. [gc1] "UFOs and Anti-Gravity: Piece for a Jigsaw", book by Leonard G. Cramp, Adventures Unlimited Press publishers, U-K., page 216, 1997. [ju1] "UFO-Related Human Physiological Effects", by John F. Schuessler, in "Physical Evidence Related to UFO Reports, The Proceedings of a Workshop Held at the Pocantico Conference Center, Tarrytown, New York, September 29 – October 4, 1997", published by the Journal of Scientific Exploration (JSE), USA, 1997. 1.2 Patrick Gross March 13, 2010 Addition [jg1]. 1.3 Patrick Gross June 22, 2010 Addition [bv1]. 1.5 Patrick Gross July 3, 2010 Additions [ju1], [fb2], [lc1]. 1.6 Patrick Gross August 16, 2010 Addition [un1]. 1.7 Patrick Gross October 21, 2011 Additions [lo1], [bb1], [id1]. 1.8 Patrick Gross August 14, 2013 Addition [pr1]. 1.9 Patrick Gross September 23, 2014 Additions [li1], [ni1], [ta1]. 2.0 Patrick Gross October 7, 2016 Addition [sa1]. 2.1 Patrick Gross November 25, 2016 Additions [er1], [ub1].